This morning I filled my duffle bag, packed up my laptop, and headed to the airport for Las Vegas. I’m only going for 3 days and two nights, so I just have a small bag and there’s no sense in checking a bag. But whether it’s a short trip, or 12 days in Europe, I carry on. A few years ago, in college (fine, it was more than just a few years) I was coming home from Mardi Gras and my foggy brain got the bright idea to check my bag of clothes and carry on the bag of beads. Just so we’re clear, I had a 15 pound bag of beads that I insisted on carrying on instead of checking. So the bag of my clothes, make up and jewelry is checked and they lose my luggage. It wasn’t until a full week later that I got my bag, but luckily I had so gold, green, and purple beads to keep me warm. Not only is there the worry to lose my luggage, it usually costs more. Flights can be relatively cheap, but the expenses add up fast, especially when you check your bags. Then, once you arrive, you have to wait for your luggage. I can’t stand the thought of waiting on anything when there’s such a limited time to see it all. Lastly, all your important stuff is close by. You start feeling a cold come on, you can just reach into your bag for your medicine or a tissue. So, you save money, get more time to travel (no waiting in line), and you don’t have the risk of losing your things. Basically, I will always carry on. Unless I’m moving. -Think about it: do you really need it? I try to keep my shoes to a minimum since those take up the most room (duh). -Use a backpack. It makes it easier to carry around. Or a rolling bag, but you never know what terrain your wheels might have to endure once your leave the airport. -Wear the bulkiest stuff on the plane. If I HAVE to have the boots, I also HAVE to wear them on the plane and on the way home. -Carry on size is 22″x14″x9″- but this is flexible, especially if you’re good at cramming and shoving your bag. -Put makeup remover wipes in your bag, instead of the 3 ounce or under liquids. You can only put so much in a ziploc bag and this will leave room for makeup and more. -Try to leave a little space, you might want to bring home a souvenir. 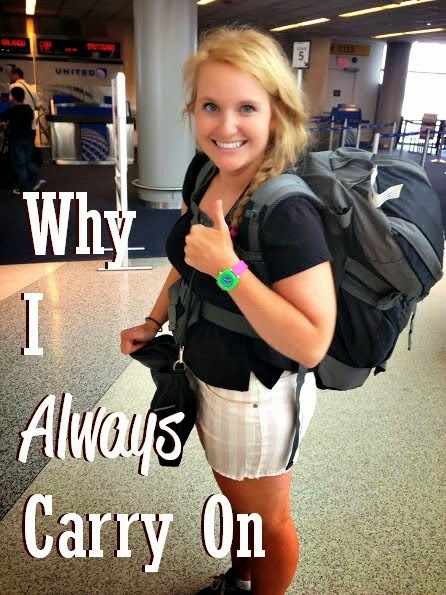 Do you carry on luggage?